Psychedelic cover of the pre-fab four in one of their zany adventures. Despite some minor yellowing of the pages due to age, this copy looks like it just came from the bookstore. 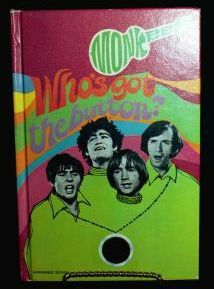 The Monkees were based on the Beatles, and were a totally "manufactured" band. Even though they used their real names, these guys were basically actors playing the part of a rock and roll band. Most of the real music can be credited to Boyce and Hart, who wrote the songs and even performed some of the earlier material. Website design and hosting by Sohodojo Business Services. Item 431 of 466 items displayed in viewer. 0 items in cart.